Midfielder Jill Scott described England as "frighteningly" good as she stressed their confidence of reaching Women's Euro 2017, despite Friday's setback. 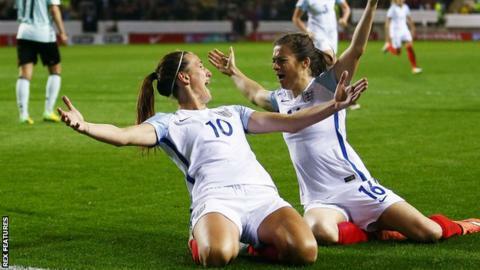 Scott hit a late equaliser in their qualifier as England came back to draw 1-1 with Belgium, who led from keeper Karen Bardsley's error. Second-placed England play Bosnia and Herzegovina in Zenica on Tuesday, when Group 7 leaders Belgium play Estonia. "We know we have to get that win," said 29-year-old Scott. The eight group winners and six best runners-up qualify for the finals, while the other two group runners-up go to a play-off in October to join hosts Netherlands in the 16-team tournament. Asked how confident England are of topping the group she added: "Always confident. I'm always confident when I meet up with England. "If you look at the players we had on the bench against Belgium it's frightening. I look to my left, I look to my right, and I'm around really good players. "We're more than capable of beating Bosnia." The Lionesses beat Bosnia 1-0 in the reverse fixture earlier this season, their first home match since finishing third at last summer's World Cup in Canada. Winger Karen Carney, effective from the bench as England came from behind in Rotherham on Friday, will be a strong contender to start on Tuesday after being praised for her contribution by Mark Sampson. The England manager also said goalkeeper Bardsley will retain her place despite her error leading to Belgium's goal - the first conceded by England in a home qualifier in almost 14 years.